The forces of time and nature have seemingly turned against Marvel’s merry mutants in Uncanny X-Men #2, by writers Ed Brisson, Kelly Thompson, and Matthew Rosenberg, artist R.B Silva, inker Adriano Di Benedetto, colorist Rachel Rosenberg, and letterer Joe Caramagna. The first issue was an intriguing, if a bit rote, reintroduction for the book, and this issue throws a few more curveballs at readers. All over the world, extinct species are returning to life, and the weather is going crazy. 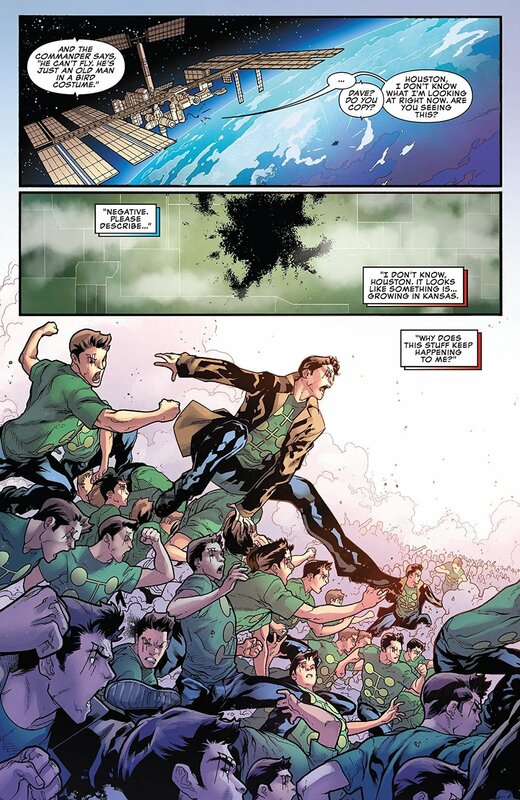 As the X-Men prepare to send a team out to help a town in Minnesota, a massive horde of Multiple Men get their attention, and they split up, each team hitting one of the two threats. Back at the mansion, the young X-Men are angry about not being asked to help when a familiar face shows up, offering to save the day. The mystery of the Multiple Men gets another wrinkle this issue, as Psylocke discovers that not only can she not read their minds, but they are capable of manifesting multiple powers now. The addition of the Madrox horde is a very nice touch to this whole story so far. It’s a clever idea, and giving them the ability to manifest multiple powers also sort of fits the motiff. They show up inexplicably at a farm in Kansas, fight the X-Men who have gathered there to stop them, and yell about their mission and how the X-Men are interfering in it. What that mission entails is anyone’s guess, and this is one of the central mysteries that keep the plot moving and the book intriguing. The other is suddenly strange changes in the Earth’s climate and the return of prehistoric monsters to various parts of the globe. The character revealed at the end of book points at a possible culprit, but even his powers might not be up to resurrecting extinct monsters and messing with the weather. The subplot with the unhappy young X-Men fits into one of the central conceits of the franchise--that of the next generation coming to take stewardship. While they may have had to be bailed out in the last issue, many of them have combat experience and, particularly Armor, believe they should be out there with the rest of team. They make a valid point, but it also shows their age. 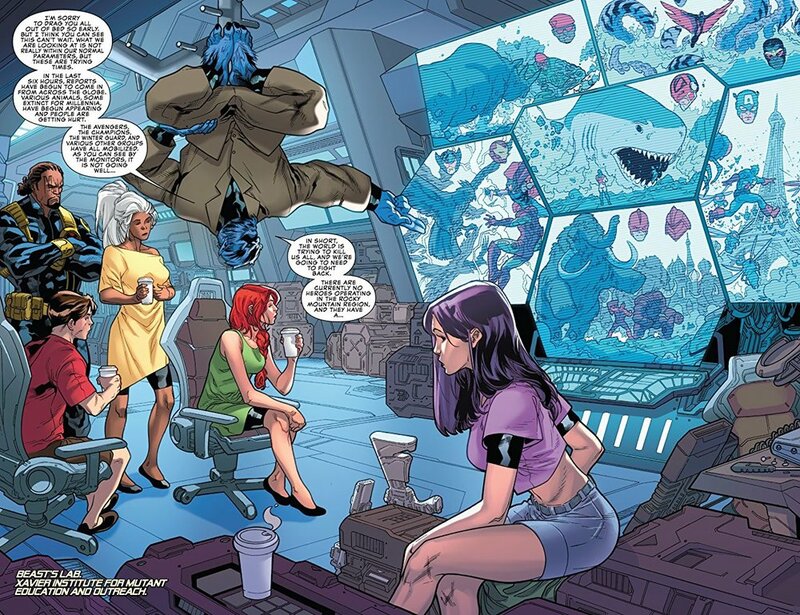 X-Men teams have failed in the past and taken much worse casualties than what they just took, but the younger members thinking that they are being punished is also very wrongheaded. With the disappearance of a prominent anti-mutant Senator after an attack by a mutant, multiple crises, and a school of even younger students, it only makes sense to leave behind some folks who can hold the fort. Their frustration is a perfect little character touch, though, one that fits the situation and is almost certainly going to be trouble in the future. R.B. Silva’s art is clean and detailed. It feels like the editors are so far trying to put art talent on the book that have similar design aesthetic, which is nice, because having multiple artists with styles that don’t compliment each other can be quite jarring. It works sometimes, especially when a story takes a sudden turn, but that hasn’t happened here yet. Rachel Rosenberg’s colors also give the art a feeling of continuity that works very well. That said, there’s nothing really special about the art. It’s not a question of it being bad, but more that there’s nothing really impressive about it. It does what it needs to do, but it doesn’t really pop. The writing team throw more fuel on the fire in Uncanny X-Men #2. The art is solid but uninspired and the story hits some nice notes, building up its central mysteries rather expertly. There’s also a lot of instances of good character writing and humor that doesn’t seem lame or forced. The first issue was good, yet safe, and used concepts that have been a tad bit overused in the franchise. This one introduces some new things, and, while it still feels safe, there’s also definitely room for things to get crazy later on, especially with the big return at the end of the book. The art could use a little more flair, but this is a satisfying comic that’s building an intriguing mystery.